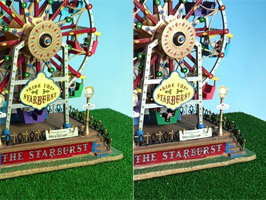 The cameras on the Sony Xperia S and the Samsung Galaxy S II are both capable of shooting videos at up to 1080p resolution at 30fps. They both use MP4 video containers and record stereo sound at about 130Kbps bitrate and 48kHz sampling rate. The video bitrate is different though - 1080p videos from the Xperia S hover at around 14Mbps, while the Galaxy S II videos come with a bitrate of 17Mbps or so. More bitrate could be a good thing - more detail in videos hence more storage required - or it could be a bad thing - poor compression algorithms wasting storage. Before we get into that, there are several peculiarities of how the cameras capture video we need to cover. First off, there's again, the Field of View. 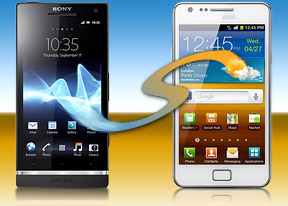 The Galaxy S II has 720p and 1080p modes that have very different fields of view, while the Xperia S sticks with the same FoV in both 720p and 1080p modes. 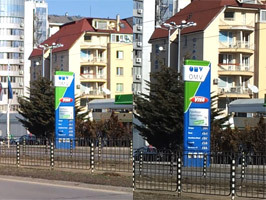 With the Galaxy S II you'll need to reframe your shot if you switch resolution. You can actually use that to your advantage if you can't fit everything you want into the shot, you can always just switch to 720p, which offers a wider FoV than the Xperia S.
There won't be any reframing necessary with the Xperia S and more importantly, you can use 1080p resolution in all occasions and fit more people or more of the scenery into the video than you can with a 1080p video shot on the Galaxy S II. 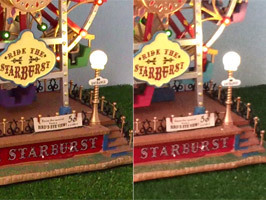 Another difference is how the two cameras handle low light - the Galaxy S II reduces the framerate of 1080p videos shot in the dark to 25fps (720p videos are always shot at 30fps), while the Xperia S does 30fps in light or dark, regardless of resolution. Finally, one pet peeve we have with the S II's camera is that it always autofocuses at the beginning of the video - you can't focus and then start recording. This means that as a general rule, the first second of your videos will be blurry. Okay, enough of that, let's talk quality. 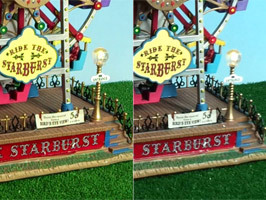 Comparing the 1080p modes is hard due to the very different FoV of the two cameras - if you think of how much each camera fits into the frame as surface area, the Xperia S fits nearly twice as much. This leaves only half as many pixels to "draw" any particular object in the scene. Here's the first 100% crop from a still frame taken from 1080p videos shot simultaneously on both phones. You can see the difference the FoV makes - the small numbers on the blue column are bigger and almost legible on the Galaxy S II, while they're not nearly as well-defined in the Xperia S videos. 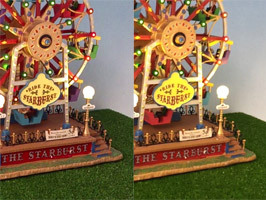 The Galaxy S II also produced colors looking closer to reality. Moving on to the next crop, which is framed the same on both phones, the Xperia S pulls ahead. The grass is much more clearly defined and so are the wooden "planks". The small "Bird's eye view" is crisper too. You'll also notice how both phones treat the same light - the Xperia S goes for a warmer color balance, while the Galaxy S II produces colder colors. Let's look at 720p videos next. The Galaxy S II again has an advantage in bitrate (11Mbps) over the Xperia S (6-7Mbps). 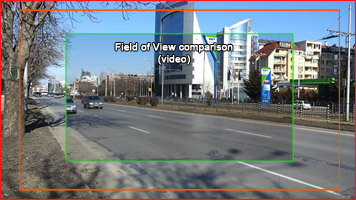 This time the fields of view are much closer, making the comparison easier. The quality of both is very close here, but there are some differences. The Xperia S seems to have a slightly sharper image (look at the buildings in the background), but the higher bitrate of Galaxy S II leaves more detail (the foliage and dirt on the side of the road). You can see the same thing in the next crop - look at the label that says "The Starburst". There's black detail inside the white letters that was resolved better by the Xperia S than the Galaxy S II. Same goes for the grass. The narrower field of view helps the Xperia S here. Still, the overall difference in image quality is practically negligible, but the Xperia S produces smaller files, which is a plus. We have to look at how the two cameras perform under poor lighting conditions. The back-side illuminated sensor of the Xperia S kicks into action and produces much better-looking videos with a lot more detail than the Galaxy S II, both in 720p and 1080p modes.